We are excited to share with you some great news! Today we are officially announcing the availability of the iOS SDK for Contentful. The arrival of the SDK should make it very straightforward to integrate the Contentful API and to distribute your content to iOS apps. Read on to find out what our iOS SDK does and how you can use it to build content-driven apps more easily. The coffee guide app from our recent hackathon will provide an example and walk you through building a simple app from start to finish. However, you are free to use Git submodules or download a static framework if that suits your workflow better. sharedClient = [[self alloc] initWithSpaceKey:@"YourSpaceKey"
For creating a client object, the Space key and a Content Delivery API access token are required. A CDAArray contains a list of CDAResource objects whose concrete type depends on the query. In this case, the items property will contain a list of CDAEntry objects. so that you can deal with Entries like with any other value object. In the guide app, the class also implements the MKAnnotation protocol, which enables directly showing Entries in a map view. 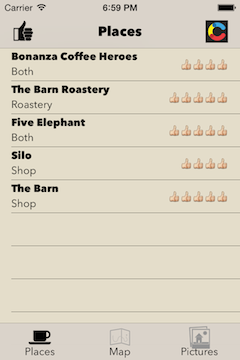 The initial view of the guide app is a list of all coffee places it knows about. For common tasks like this, the SDK brings some UI components which can be customized to your needs. In this case, we will create a subclass of CDAEntriesViewController, a UITableViewController optimized for showing a list of Entries matching a certain query. The cell mapping is a dictionary for specifying which property of the UITableViewCell corresponds to properties in the content model. In addition to that, the shared client is specified as the client to use and the entries are limited to a certain Content Type. Setting the query property is optional, in that case all Entries will be shown. You need to specify a layout, just like in a normal UICollectionViewController and there is also the cell mapping again. For convenience, there is a ready made collection view cell class which fetches images from the URL in its imageURL property, so that is what we are going to use in this example. The resourceType property defines which type of Resource is going to be fetched, in this case Assets. A CDAAsset has a direct accessor for the URL which is used in the cell mapping here. Finally, the client needs to be specified, like in the previous example. Of course, it is also possible and often needed to write normal UIViewController subclasses and just pull in some data from Contentful. The class BBULocationViewController from the guide app does just that, utilising the BBUPlace class mentioned earlier. That way, it does not have specific knowledge about the Contentful SDK. Links might not be resolved, depending on your query. If that is the case, use the resolveWithSuccess:failure: method on any CDAResource. This should be done inside your custom class, look at the fetchPictureAssetsWithCompletionBlock: method from BBUPlace for an example. Fields can include Markdown. There is another example app which shows how to use the Bypass library for converting Markdown into NSAttributedString which can be displayed in a UITextView since iOS 7. Depending on your use case and target platform, you might want to evaluate other options, for example converting to HTML. 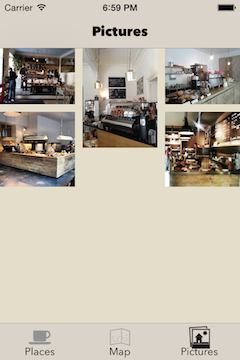 With this, our walk through the coffee guide app is done. You should have everything you need to start building your own iOS apps with Contentful. Check out the SDK and start building. For more information about managing content in native iOS, watchOS, tvOS and OS X apps, see our article: Selecting an iOS CMS.